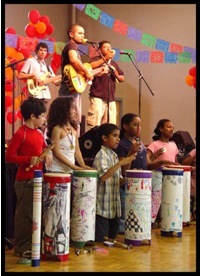 A festive and FREE celebration of Mexican-American music will be presented by American Roots Music Education and Metro Parks and Recreation on Saturday, May 31, 2008 at the newly renovated Coleman Park Community Center. Throughout the afternoon there will be lots of live music from local bands, including Ocho Treinta, Son Latino and Danny Salazar y Trova Urbana. At 5:00 pm the internationally renowned group from San Antonio, Texas, Los Texmaniacs, will perform. Children can participate in crafts such as making paper flowers, cowboy hats, embossed tin boxes, lizard keychains and rhythm instruments. A children's folklorico group will perform at 3:30 and there will be lots of piñatas, an exhibit of visual art by Latino artists, and plenty of dancing. Food and drink will be available for sale from local vendors. Good weather -- outside! Not-so-good weather -- in the gym!